According to HomeAdvisor.com, the average cost of window installation depends on a variety of different factors. Keep in mind that this estimate can change based on how many windows you need, window size, and the materials used. For example, wood windows cost more than vinyl windows. Whether you are shopping for replacement windows or new construction windows, we hope our home window buying guide helps you make an informed decision. For more information, we recommend reaching out to a window installation company near you. If you are tired of drafty windows that do nothing but increase your energy bills, you may want to consider window replacement. Energy efficient windows can help your home feel more comfortable in the winter without cranking up the thermostat, saving you money in the long run. To find the best rated home windows, you’ll need to keep in mind that different ratings mean different things. You’ll need to decide which windows have the best energy efficiency for your budget. Whether you are building a custom home or are adding an addition to your home, you want to think carefully about where to install windows. How your home is built and its surrounding landscape will determine where you want windows installed. For windows that receive a lot of sunlight during the day, you’ll want to look for windows that rate low for solar heat gain coefficient. On the other hand, windows that are in the shade won’t need as low a rating for solar heat gain coefficient. The direction your windows face will determine how much sunlight they receive during the day and how much heat is let into your home. For example, windows that face to the east let in more sunlight in the morning. For windows that let in a lot of sun, you’ll want to look at options that give you energy efficiency. Energy efficient windows make it easier to heat and cool your home so you can stay comfortable year-round. The type of window frame you choose determines its cost and energy efficiency. 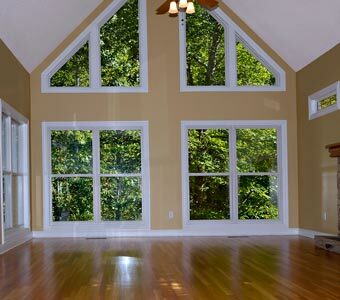 For example, wood frame windows are energy efficient, yet cost more than other materials like aluminum. Many homeowners also appreciate the classic aesthetic of wood windows and that value they add to their homes. If you are unsure what window frame materials are best for your home, we recommend reaching out to a window replacement company near you. The window replacement contractors at Abode Building Center work hard to earn your business so that you are satisfied with your new windows. If you are interested in learning more about our window replacement services, be sure to give Portage window contractors a call at (269) 329-1800.